MARY PILON: We do know that board games are just about as old as civilization itself and human beings. GREG MAY: They are here four nights a week playing this card game that’s been around since I was a kid. And it’s an activity in which the mere participation brings joy, regardless of outcome. Right? TOM WHIPPLE: Losers look for joy; I look for victory. KRISTEN: Hot damn! Woo! Yeah! I love to play games. There, I said it. For a long time, I was afraid to admit how much I like playing games because it seems a bit childish. And as adults, we are encouraged to do away with childish things. But you know what? I’ve changed my mind. Because playing games means that you’re taking part in the glorious progression of civilization. My favorite game, for instance, is backgammon. PILON: So backgammon is a great example of a game that has ancient roots, in this case Greek. PILON: Mary Pilon. I’m the author of The Monopolists, a book about the secret history of the board game Monopoly. Pilon knows the history of other games as well. PILON: Senet goes back to Egypt around 3500 B.C. Go and Liubo, which are Chinese games, also go back to the earliest known civilizations in that country. Ur goes back to Mesopotamia. Parcheesi goes back to India. Dice: Mesopotamia. Backgammon: Byzantine Greece. Checkers: ancient Egypt. And then, of course, Monopoly, 1904. And a whole bunch of other stuff in between. Game-playing boomed in America. Much of the boom emanated from Massachusetts, home to both the Parker Brothers and Milton Bradley companies. Boston had a lot to do with it. PILON: It was a major port; it was a major shipping hub. So a lot of these games that had ancient roots were coming through via the sailors and folks on ships. In the U.S., ancient games were modernized. New ones were invented. And history itself conspired to create demand. PILON: So, first of all, you have electric lighting. Now you could play games at night. Also, child labor was going out of fashion. PILON: We start seeing laws that allow for children to go to school. Just across the board, you have a rise in leisure time. Board games become part of a lifestyle that previous generations wouldn’t have even conceived of. Fast-forward now a few more generations. MARTIN WALKER: Newer games allow more — there’s more creativity, there’s more strategy. Like, the classic games are fun, but Monopoly or Chutes and Ladders, you’re just rolling dice, something happens, and that’s it. WALKER: Takenoko. It is a map-building, bamboo-growing, panda-eating board game. ANN: Jenny, I will slay you. I just started this game, and I will slay you. WALKER: She will throw me under a bus. CHIN: All right we’ll see about that. WALKER: We’re going to find out who’s the most competitive. WALKER: We’re each helping to grow a farm. But we’re also taking advantage of what they built and taking it from them. ANN: It’s kind of similar to Settlers of Catan. CHIN: Yeah, you’re building the same map, but you have your own agenda. Yeah. Greg May is the founder of The Uncommons. GREG MAY: I’ve always loved board games. And I’ve always felt like there needed to be a place — a sort of home — for games in New York City. So that’s what he started. With a collection of nearly 1,000 board games. MAY: There’s been this explosion and growth in games that weren’t around when I was a kid. GIL HOVA: I’ve designed Bad Medicine, which is a party game where the players are all pharmaceutical companies making horrible drugs. Gil Hova is a board-game designer and publisher who lives in Jersey City. HOVA: I usually drop by here just to see how things are going, what people are playing, what’s been selling, that sort of thing. I have a game coming out later this year called The Networks, where the players are all running television networks starting with three horrible public-access shows and slowing improving their network over five seasons. The business has been incredible. I’m almost sold out of Bad Medicine at this point, out of my entire print run. And I raised over $100,000 on Kickstarter for The Networks. That is a true fact. And Hova is not the only game designer crowd-funding his work. Kickstarter has an entire division dedicated to games. According to Luke Crane, who runs that division, last year nearly a million backers pledged more than $140 million to games. A lot of these, however, are video games, not old-fashioned board games. And before you get too excited about some board-game renaissance, consider the sales numbers on board games versus video games. 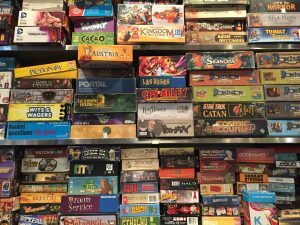 Board-game and puzzle sales in the United States bring in about $1.6 billion a year. Video game sales in the U.S. total more than $23.5 billion a year. So for every dollar we spend on board games and puzzles, we spend nearly $15 on video games. Whatever the case, the instinct to play some kind of game, with some kind of opponent, is extraordinarily common, and long-lived. PILON: Just about every civilization with dates that go way, way, way, way, way back, they were playing games. Some of them were race games — so that’s what you think of a path with little markers that you move, trying to get ahead of an opponent. Some of them were more strategy-based. Some mimicked the world that was around them, and had warfare as a theme or religion as a huge recurring theme in early games. And often games were used by religious leaders as a way of fortune-telling, but also winners of games often had a spiritual aura about them, because they were able to win something that combined luck and skill. Pilon herself is a gamer. PILON: So, my family has taken to playing Settlers of Catan at holidays, and it’s an extremely popular game. It came out of Germany, like a lot of really fantastic games do. There’s many things I love about it, but it turns us into animals. It brings out the best and worst in us, particularly the adults. At least at one Thanksgiving, there had to be a handwritten apology note; there were accusations of theft; it really gets extreme. But it’s a great way for everybody to get together. TOM WHIPPLE: Some people — I’ve heard some families, they get together at family gatherings and they think, “this will be pleasant. We will play a few games and we will have a lovely evening.” And I sort of just find it extraordinary. Now I’d like you to meet Tom Whipple. We’ll get to his c.v. shortly. WHIPPLE: I have an early memory from when I was 9 or 10, and we were gathered with extended family and we were playing a game — I can’t even remember the game, but what I do remember is that my Uncle Terry, when he beat me, this 9-year-old who he had seen grow up and play with his kids, he stood up, he jumped on the sofa and he pointed at me and with each point and with each bounce of him on the sofa he says, “I win, you lose. I win, you lose.” And that sort of taught me, I suppose, the morality of game-playing that I’ve taken with me. It’s about: I win and you lose. So I suppose this book was an attempt to codify that in such a way that I can eventually beat Terry. Whipple has written a book titled How to Win Games and Beat People. In his day job, he’s the science editor for The Times in London. WHIPPLE: I mean, “editor” is a very grandiose title. There are two of us who cover science for The Times and we try to read the major journals — Nature, Cells, Science — and see what the interesting and important science stories of the day are, and then we try to make them accessible in 600 or fewer words for the public. DUBNER: And are you — or have you ever been — a scientist yourself? DUBNER: Oh, and you want them to talk to you like you’re an idiot? WHIPPLE: I want them to talk to me like I’m an idiot, particularly if I’m at CERN or something like that. DUBNER: I was hoping, and this is going to sound terrible — I gather if you still want to beat Terry, that he is still alive — I was hoping he’d meet a grisly death after doing that to you. WHIPPLE: Terry is alive, and he is aware that I am on my way to take the advice in this book and try to get my own back, because it’s been a long time coming. If you’ve been keeping up with Freakonomics Radio, you know this is Self-Improvement Month. We’ve been trying to help you become more productive; to master a skill; to increase your grit. Today, how to win any game — if not with grace, necessarily — with Tom Whipple as our guide and his book as our bible. WHIPPLE: Really the premise for it — I suppose the elevator pitch — was: it’s preposterously overqualified people advising on games. So I have a Special Forces soldier on pillow fighting, and I have a structural engineer on Jenga. And game theorists all over the place. DUBNER: But let me ask you, I guess, an obviously paradoxical question about your mission here. Let’s say I’m the only one who reads the book, and I learn how to win every game, then I plainly have an advantage. But if you read the book, as well, then you have the same advantage and then the game-theory puzzle becomes a very different one, does it not? WHIPPLE: I mean, yes. You’ve described a meta-game theory problem. It’s game theory about a book about game theory. How many people read my book before it’s a failure? I’ll just say — I think both my agent and publisher would agree with this — I’m very happy to take that risk. If enough people are prepared to buy my book, I’d consider that I’d won a completely different game which is the game to get a house in Kensington. DUBNER: Let’s take Jenga. First of all, describe why you went to a structural engineer to figure out the best way to win at the game. Who had a relatively simple goal in life. WHIPPLE: He said to his wife, “I want to quit my job to become the world’s best stone-skimmer.” And for five years he trained. But the interesting thing about this was: there is a lot of theory on this. It’s a standard undergraduate physics problem. And I was going to go to one of these physics professors to find out from them what the optimal way of throwing a stone is, and they all agree on the angles and the velocities and the spins and all of this and they get their undergraduates to work it out. And obviously the problem with that, as I know well having studied maths, is there are — angles, velocities, and spins are all based on a perfectly spherical stone in a frictionless environment that does all these things. And actually what Kurt Steiner discovered was that none of it was true. And it’s one of these wonderful things where you think science is so advanced that normal people can’t do anything about it, but he’s definitively proved all this science wrong because he got 88 stone skims. DUBNER: And does that make him something like a world champion? WHIPPLE: It exceeded the previous one by more than 20. Essentially he stopped counting. The YouTube clip is up and I’d urge everyone to Google it because this is his Sistine Chapel. I mean he’s given this gift to the world of this stone that just floats along the lake; it’s absolutely extraordinary. And the way he did it was: he aims — rather than the physics which says you throw it in at angle and it comes out at that angle, he throws it at about 30 degrees and he throws so fast, he uses his whole…. DUBNER: Thirty degrees down or up? WHIPPLE: Thirty degrees angled towards the horizontal. DUBNER: What would look like straight down into the water. WHIPPLE: It would be pretty close to straight but he throws it so fast. What he does is he moves his entire body, so he swivels his shoulder — and he’s got colleagues in the profession who’ve had sporting injuries as a consequence of doing stone skipping — where he swivels his whole shoulder back and brings his arm and it’s almost like a whip and all of the movement goes into the very tip of his arm and out goes the stone as fast and with as much spin as possible. It looks likes it’s going almost directly down into the water. Except by the time it hits the water, it’s not going directly down, and it comes out at about five degrees. DUBNER: OK, so here’s the thing. Most people listening to this are probably not going to take up stone skipping, only because it requires a lot of things, you know: the water, the stones, an arm, a fair bit of lunacy, and so on. But many, many, many people who listen to this do routinely play games with their friends, family, people they love, people they might not love so much. And I would like to propose that you and I, right now, on the radio, play a few of these games against each other and see how it works out. Are you up for that, Tom? WHIPPLE: I’m absolutely up for that. DUBNER: I asked you to prepare a little bit by bringing into the studio a couple of the games that I’ve brought into the studio. And I do want to make an admission to you, which is: as a professional, I have not acted professionally here, in that typically, I would read the book, or at least most of the book, of the person I am interviewing. And in this case I purposely did not read it, because I did not want to know your secrets, yet. So let me apologize for not having read your book, yet. WHIPPLE: That’s fine. I mean this slightly fills me with dread because it means it makes it all the more embarrassing when I lose. DUBNER: Well that was kind of my idea, Tom. I was thinking that if I could maybe beat you — I thought we would play four games — and I thought if I could beat you at one where you have the optimal strategy for all four, that a 1-3 record might make me look a little bit like a hero. WHIPPLE: As game theorists call it, I think that would be our Nash equilibrium, because if I can only lose on one then I would be very happy as well. DUBNER: So how would you feel about one victory and one draw for me? Would that push us over into the hero category for me, or not quite? WHIPPLE: Well, if we are going to do games like Rock, Paper, Scissors, then there is an element of chance I can always blame. I can always say it’s only 60 percent in my favor. DUBNER: Oh! Already blaming with the chance, yeah. WHIPPLE: I’ve got to get the excuses in early. Tom Whipple agreed to play four games with me. I have prepared by not reading his book. What you’re about to hear is a substantially edited version of our battle, because it took us more than two hours to play, and I don’t think even the most devoted Freakonomics Radio listener is interested in listening to two grown men play board games for two hours. Whipple was in a radio studio in London; I was in a studio in New York. DUBNER: I thought that we could begin with Connect Four. Does that work with you? WHIPPLE: Well, the point of this game, or this book, is that we shouldn’t really trust each other and we are all out to win, so, no, I understand. DUBNER: Well said. OK, so I’ve got here the executive producer of Freakonomics Radio, Arwa Gunja. Arwa, can you just say hello? DUBNER: And Arwa, is there anything you can say in a sentence or two, do you want to take a pledge of honesty as moderator or referee? GUNJA: I will take that pledge. I also brought with me my iPhone, so I can record anything if we need it for the record. And I also have a very official referee’s whistle here. DUBNER: I just have to say Tom that I didn’t know about the camera so my strategy needs to change very rapidly. And Tom, do you have someone there with you in London? WHIPPLE: Yeah, I have, if Molly Fleming will say hello. DUBNER: Hi, Molly. So, Tom, you apparently know how to win at this every time, presuming you go first, I understand, correct? WHIPPLE: Well, yeah, it is possible to win every time presuming you go first; that’s been proven by computer. And I know a very good strategy for ensuring that so long as no one makes any stupid mistakes along the way, you always win if you go first. And probably if you go second, but it depends upon my ability and your ability not to make stupid mistakes along the way. DUBNER: So I guess I should let you go first then. WHIPPLE: You go first and then I’ve got something more to blame. DUBNER: OK, you want to play yellow or red? Whipple and I each had a board in the studio with us but, because we couldn’t see each other’s board, we agreed to label the boards so we could replicate each other’s moves. So, we labeled the X axis with numbers 1-7, from left to right, and the Y axis with letters A-F, from bottom to top. DUBNER: Did she go first? WHIPPLE: I think you’ve heard of the Fischer-Spassky chess match. WHIPPLE: This was the equivalent in Connect Four. It was, at least according to showbiz press, and if you can’t believe the show-biz press, then where are we in the world? Kanye West, Jay-Z, and Beyonce were backstage in 2009 and what do the three biggest names in world music do when they’re backstage? 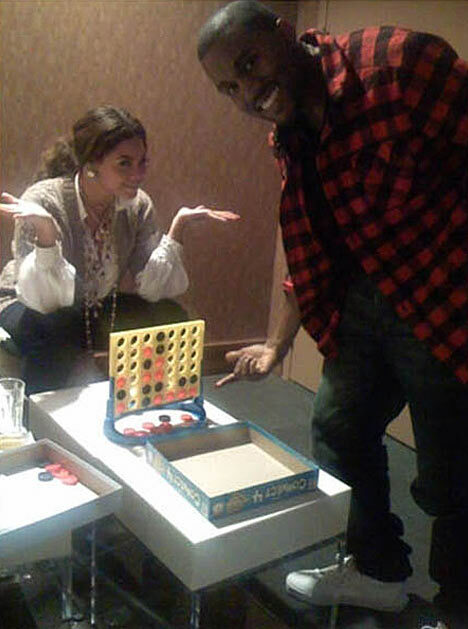 Well they had a Connect Four tournament and Kanye West, who describes himself in his music as God’s vessel, lost 8-1 to Beyonce. DUBNER: That’s an argument for atheism right there. WHIPPLE: She is indeed my inspiration for this game. DUBNER: Wow, so you’re not channeling a mathematician; you’re channeling Beyonce, which is a much more formidable force. WHIPPLE: Exactly, yeah. You don’t argue with Beyoncé Knowles. WHIPPLE: Oh dear, it’s not good for Blighty. DUBNER: Tom, so plainly I stumbled into a lucky progression there and happened to beat you. WHIPPLE: Well, that’s very sweet for you to say that you stumbled, but what I will say in my defense: in some sense what we just had is the classic Connect Four game. Sometimes you’ll lose because someone will spot a cunning little fork or you won’t spot that someone has got three in a row. But often you end up filling it up and then you are forced in the last column to make a play that you know is going to give your opponent victory. It’s a German word zugzwang. Have you come across this? DUBNER: I haven’t; I like it though. WHIPPLE: The Germans have a word for everything, and it’s not surprising that maybe in the milieu of central European politics they had this word because it’s a word that means being forced to do something that will guarantee your enemy victory. DUBNER: Oh, I do – I zugzwang everyday, I have to say. I’m glad to know there is a word for it. WHIPPLE: Well, there you go. So, that’s zugzwang. We mentioned the epic struggle between Kanye West and Beyoncé Knowles. What was also reported at the time was that the reason she won was because she had read the master’s thesis of a guy called Victor Allis. Now obviously I could have interviewed Kanye West for my book; I could have interviewed Beyoncé Knowles. But why interview either of them when I could can go to a Dutch computer scientist called Victor Allis? He had designed a program that always played the optimal move in Connect Four. And it had been proven mathematically to be perfect. There are four and half trillion different combinations in Connect Four. But what he said to me, he was a relatively keen player and he says, “I bet you’ve lost games of Connect Four where you feel ‘that was just bad luck.’’’ And I suppose before I had spoken to him I could have put what happened to us down to bad luck as opposed to extremely bad play on my part. And he says, “it’s not bad luck. It is not bad luck when you put that there, when you are forced into zugzwang.” Because actually if you go first, you will be in the situation where you will find that final four in the row — you’ve got these three dangling, waiting to be filled, and you will find that the final four in the row, it will be completed on an odd row. If you go second, it will be completed on an even row and that’s exactly what we found. If I did a three in a row, ready for completion on an even row, by the end of that game, I would have won. But you had won on row number 3. And you won, and that’s why. DUBNER: All right, shall we disgorge our checkers because that’s always been to me the most fun part of Connect Four? MOLLY: I’m going to have to bow out, I’m really sorry. I’ve got to go. MOLLY: No it was really lovely; it was really fun. Good luck with the next one, not that you need it. DUBNER: Thank you very much. So we lost our London observer but, having one victory in hand, I wasn’t too worried. Our next game was Hangman. We would play two rounds – one with Whipple guessing my word, one with me guessing his. The guesser could guess 10 wrong letters before being hung, representing the head, torso, two arms, two legs, the rope, and three lines for the gallows themselves. WHIPPLE: So all I need to know is how many letters. DUBNER: OK, and I’ll tell you there are four letters. Now tell me immediately, is that a good thing to go short, or bad? WHIPPLE: Oh yeah, it’s a very good thing to go short. DUBNER: All right. Go for it. GUNJA: That is a miss. Nine guesses remain. GUNJA: That is a miss. Eight guesses remain. WHIPPLE: Oh you have done something with a “Y” or something, haven’t you? GUNJA: That is a miss. WHIPPLE: That is a miss. Damn. DUBNER: We don’t even have the gallows built yet, but soon we will get to your body. DUBNER: That’s a negatory, Batman. GUNJA: The gallows are complete. GUNJA: Another miss. Five guesses remain. DUBNER: If I wanted to march you to towards your doom, I would just challenge you to another game of Connect Four, no offense. GUNJA: The first letter is a “J.” So you have a “J,” second letter is an “O,” and two blanks. Five guesses left. WHIPPLE: Well, I am going to go for — this a good question. See now I am looking at what words would actually work. WHIPPLE: So this is completely — I’m thinking “Jowl”. DUBNER: Beautifully done! Tom Whipple! WHIPPLE: Oh you’re just overpraising after the Connect Four disaster. DUBNER: I’m not. I’m really impressed. “Jowl” I thought was almost — I thought it was a good word. WHIPPLE: “Jowl” is a really good word. DUBNER: And you emerged with everything but your head intact, which is, you know, something. So, that was really well done. So you’ve just proved that from the guesser’s perspective you’ve had a strategy that happened to work beautifully there. Could I learn that strategy as well pretty quickly? WHIPPLE: Quite boringly there is a table in my book which got the first letter on the board. The strategy for this, I should say I spoke to Nick Berry, who is a data scientist at Facebook, who looks into these things in his spare time. And what he said to me was, “Tom, I bet you think you’re good at Hangman. You’re not.” And then he said, people who think they’re good at Hangman, the more naive ones, what they guess first is vowels, which is, indeed, what I used to do. So I was at the lowest level of sophistication on his strategy. And then he said, if you get a bit more sophisticated, you learn about letter frequency analysis. It actually started in Baghdad in the 9th century. There was a guy who went through the Koran and wrote down — a guy called Al-Kindi — wrote down the frequency of every single letter that popped up, and he didn’t just do this for fun; he did it because cryptography at the time was almost always based on letter substitution. So for instance, you would change the word “cat” — you would add one to each letter — so you would change the word “cat” to D-B-U and then you would send your letter and he realized that if he knew that a particular letter popped up more and had a big enough corpus of data to decode, he could begin to work out which letters were which. So he blew apart cryptography by doing this. So from that, we have the basic letter frequency in the English language. And he said, “well I bet you think this makes you sophisticated.” And then he said, “well, actually it’s not.” Because if you think about it in Hangman what you’ve got is a lot of words you’d never use. A lot of the most common words. You’d never use the word “A” in hangman. You’d never use “and” or “of” or “the.” If you play hangman with somebody who puts down the word “the” then that really is the time to reconsider your friendships. And so then he produced a different letter frequency of the words in the English language excluding those. So previously it was E-T-A-O-I-N, and if you get rid of those words you’re left with E-S — for “sugar” — I-A-R-N.
DUBNER: So that’s the optimal kind of first guessing streak, yes? WHIPPLE: No. Cause then he said, you’ve forgotten about the amount of information you’ve been given. I’ve just been told that this is a four-letter word. Well, the frequency of letters in four-letter words is completely different. Think about it. Think of all the endings that you can’t have. You can’t have the “-ing” ending. You can’t have the “-tion” ending. It would be mad if the letter frequency in four-letter words is the same as the letter frequency in the English language. So actually the most common letter in four-letter words is “A” but the most common letter in five-letter words is “S.” It’s “E” in six-letter words and it’s “I” in thirteen-letter words. DUBNER: Once you land the first letter then you reassess the kind of word that you’re thinking about or no? WHIPPLE: Well, yeah, so his whole principle behind this, which I certainly subscribe to is: the really key thing is to get that first letter. So let’s say, as was the case with this, it’s a four-letter word, and I’ve guessed “A” because that’s the most common letter in four-letter words. Well if that doesn’t come up, you’ve just change the search again. The frequency of letters in four-letter words that don’t include the letter “A” is completely different. So that’s your strategy for getting the first letter. And then obviously you could extend this if you had a lot of time on your hands. But I just went back to the letter frequency in the English language. Then I went to the letter frequency for silly buggers and just decided to go “J,” so I went a bit off piece there. DUBNER: All right that was very stressful though, that was fun. Can we play another? WHIIPLE: I’ve got a three-letter one up on my end of things. DUBNER: All right, so I’m going to use your chart because that’s what it’s for. And I see that if I have a three-letter word, the optimal calling order is A-E-O-I-U-Y-H-B-C-K, so I’d be a fool to ignore your advice, except for the fact that you wrote the advice. WHIPPLE: Or I could have just done “cat,” because I would have just thought that you wouldn’t think this way. GUNJA: “Y” is a miss. Nine guesses remain. WHIPPLE: “O” is not in it. GUNJA: Dubner has 8 guesses left. WHIPPLE: “A” is the second letter. DUBNER: Oh, so you went easy on me. Either that or you thought you were pulling the double switcheroo because “A” is the first letter in the optimal calling order. WHIPPLE: I’ve forgotten how many switcheroos we’re on now. DUBNER: Now I think it calls for some psychoanalysis. So, what did you have for breakfast today, Tom? WHIPPLE: I had toast and bagels. DUBNER: Was there jam on your toast? WHIPPLE: I couldn’t imagine where you were going. Yes there was lashings of jam of my toast. DUBNER: I’m not familiar with the word “lashings,” but I’m focusing on the jam. Do you have pets at home? WHIPPLE: I have pet tortoises. DUBNER: But no feline-type pets? DUBNER: How do you feel about feline-type pets? WHIPPLE: I’m ambivalent towards feline type pets. WHIPPLE: That’s the first one. DUBNER: The minute you said you were ambivalent, cause can I tell you why? Nobody is ambivalent about cats. Either love cats or you hate cats. WHIPPLE: You’re right; you’ve got my tell. You’ve got my tell. DUBNER: How about we play Battleship? DUBNER: Is there a large advantage to going first? WHIPPLE: I don’t think anyone has particularly done the maths on it, but I don’t think it’s huge. DUBNER: All right, Tom you can go first then. After multiple rounds of Battleship, Tom Whipple had taken out one of my ships and was dangerously close to taking out several others. I still didn’t have one hit. DUBNER: So, I’ve got to wonder now. I’ve really scattered the board. Ten scattered guesses and not a single hit, and I can’t remember ever playing ten first guesses and not a single hit. So I’ve got to think that rather than scattering, you’re maybe clustering and that there is quadrant that I haven’t stumbled into where I will find the mother lode. Would the quadrant include H8? DUBNER: Again, you did put ships on the board, yes? WHIPPLE: There are ships, there are photographs to prove it, they are just using their British pluck to evade your artillery. F8. DUBNER: F8, hit and sunk. You’ve sunk my 3-hole ship. So you’ve now sunk a 4 and a 3. So I can tell you because you’re my friend, and I think your going to beat me anyway, I am worried about my strategy now. Do you understand why I’m worried besides the fact that I’m behind? WHIPPLE: Is it because you’ve been putting ships next to each other? DUBNER: Confound you, but if indeed I’ve done that consistently, then the confounding will come to a crashing halt. DUBNER: I appreciate your thinking of me as strategically as that and as nastily as that. Clearly my strategy was a horrid failure. An embarrassment. I did finally get a few hits, including Whipple’s destroyer – that’s the ship with just two holes, the hardest one to find. WHIPPLE: You’ve gotten rid of my most valuable ship. DUBNER: All right, well, that’s something. WHIPPLE: So people who play this competitively, which are vanishingly few, would not generally put many ships on the outside of the board. WHIPPLE: Well, if you think about the hunt strategy, once you’ve targeted it, once you’ve hit someone’s ship, you then have to look at the four squares either side of that hit to see which way the ship is going; to see if it’s going up, down, left, right. If you’ve got it on the edge of the board, you’ve immediately put it in that situation, and for exactly the same reason, ideally you wouldn’t put ships next to each other because then there is a chance in hitting one, just in your search strategy, you’re going to get a hit on two. Now, because that’s a strategy, obviously you then have to mitigate it, which is why I put one of mine on the edge of the board, because people know it’s bad to put them on the edge of the board then it’s — sometimes, you want to mess around with them and put them on the edge of the board. DUBNER: So it sounds as though you’re saying that your planting strategy, your setting-up-ship strategy, is to place them what seems to be randomly, while avoiding the edges. DUBNER: Yeah, yeah that makes sense, that’s sort of an 80-20 ish sort of rule. Finally, calling “J9,” Tom Whipple took out my last ship. DUBNER: J9 hit and sunk to the winner Tom Whipple. Congratulations, well played. DUBNER: I am so shamefully embarrassed by my horrible play here, but hopefully it can help another player win another day. WHIPPLE: Yeah, it’s demonstrated a point. You are a cautionary tale in Battleship. It was time for our final game of the day: Rock, Paper, Scissors. We agreed to play best of nine throws. DUBNER: We used to say, “Rock, papers, scissors says shoot.” That’s our rhythm, but tell me what you do. WHIPPLE: It sounds like what baboons do with their bottoms, doesn’t it? DUBNER: So you’re running the show here so we will say “1,2,3 present” is what we are going to say? DUBNER: All right and we will say it at the same time? Are you ready to play then? WHIPPLE: OK, let’s do it. DUBNER: So let me just say something before we go. On the first throw, I’m throwing rock, OK? Ready? WHIPPLE & DUBNER: 1,2,3 Present. GUNJA: A win for Tom. DUBNER: A win for Tom, and I told the truth. GUNJA: Scissors cuts paper, that is a win for Stephen. GUNJA: Rock crushes scissors and that is a win for Tom. So it is 2-1, Tom. GUNJA: Scissors cuts paper. That is a win for Dubner. So it’s two all. GUNJA: Rock crushes scissors, that is a take away for Whipple; that is 3-2 Whipple. DUBNER: You may have noticed by now that I have employed four scissors consecutively. WHIPPLE: I have. I have, and I think you flagging it up means I’m definitely going to do rock next time. DUBNER: It’s what I call the super-seamstress. A seamstress I understand is three scissors in a row, but the super seamstress — I think I may have invented the super seamstress. I’m not sure. WHIPPLE: I think that’s accepted in competition play. DUBNER: I know there are many names for these patterns. So let’s see what we’ve got, ready? GUNJA: OK, rock crushes scissors; that is a win for Whipple. It is now 4-2. GUNJA: Paper covers rock, that is a win for Whipple, it is 5-2 Whipple. GUNJA: Rock crushes scissors, that is a win for Dubner, it is 5-3 Whipple. WHIPPLE: Oh that was really tense; it was just good for the game. DUBNER: Very well done, very well done. So now that we’ve heard me get crushed by you, the master, give us your masterful advice on Rock, Paper, Scissors. WHIPPLE: Well, the first thing to say about Rock, Paper, Scissors is that there shouldn’t be a strategy. The optimal strategy is that everyone plays randomly, and you are equally likely to win or equally likely to lose, which makes it a fantastic psychology problem, because humans are incapable of being random. The reason I know what to do is because there was a bunch of Chinese researchers who decided that they were going to find themselves a phenomenally indulgent grant awarding body, and they were going to get 300 students to play 360 games of Rock, Paper, Scissors and then they were going to look for strategies or look for ticks. The non-randomness that could be exploited. And the ones they found — it’s almost embarrassingly as an insight into how the human brain works. So if you lose, if say, my rock beats your scissors, then you’ll think, “right, I need to make these scissors more powerful. I’m going to go to a more powerful thing, so I’m going to go to rock.” So if you lose, then I have to think, next time, if you lost on scissors, you’re going to play rock, so I need to shift up to paper. And if you win, then you think, “well that went well. I think I’ll stick with that one.” So if you won on rock, then you would be likely to stay on rock, and so I should go on paper. It gives you an edge. I mean, I don’t think it’s — there’s a huge element of chance, and I can’t say it would have actually made the difference in our game as opposed to being chance, but it gives you just that small edge in a game that is meant to be purely random game of chance. DUBNER: So, I assume that according to your master strategy, that my subversion strategy of throwing five scissors in a row to create the appearance of basically lunacy is a bad strategy. WHIPPLE: I was just sticking with that particular strategy so I wasn’t particularly noticing. The only thing I would say is that when we drew, I went with a different strategy, which is I went paper, because scissors, contrary to what you what you were doing, are actually the least used statistically of all of them. DUBNER: Scissors are the least? I assume that rock is the most? WHIPPLE: Yeah, they are used — the other two, paper and rock are pretty equal but scissors are 29.6 percent of the time, when they have been analyzed. DUBNER: So, Tom, you have crushed me at Rock, Paper, Scissors. You beat me soundly at Battleship. We hung each other once in Hangman and I got lucky on Connect Four. So here’s my question for you: having become master or at least a surrogate master for the proper masters of all these games and having written this book about how to win games and beat people, is there any element of joy that’s diluted when you win by knowing the optimal way? It’s not cheating, but it’s kind of a different version of gaining an advantage over someone else. WHIPPLE: I think joy is the wrong paradigm for this. Joy is a sort of thing that people say, “oh it’s the taking part that counts.” It’s the battle cry of the loser. Losers look for joy; I look for victory. And that’s what I’ve got and then I’ll go and live my cold, shallow life, but I’ll have won. And so who’s the real loser? TIM FERRISS: My name is Tim Ferriss. I am a human guinea pig and a professional dilettante. Tim Ferriss: charlatan or wizard? The man behind The Four-Hour Work Week and other Four-Hour books tells us everything he knows about self-improvement. FERRISS: Good way to trap your monkey-mind on paper so it doesn’t distract you and sabotage you for the rest of the day. FERRISS: It’s one of these fixations that I’ve not been about to get rid of. DUBNER: You are a weird dude. Freakonomics Radio is produced by WNYC Studios and Dubner Productions. Today’s episode was produced by Arwa Gunja. The rest of our staff includes Jay Cowit, Merritt Jacob, Christopher Werth, Greg Rosalsky, Kasia Mychajlowycz, Alison Hockenberry and Caroline English. Thanks to Molly Fleming for being our London-based referee. If you want more Freakonomics Radio, you can also find us on Twitter and Facebook and don’t forget to subscribe to this podcast on iTunes or wherever else you get your free, weekly podcasts. How to Win Games and Beat People: Demolish Your Friends and Family at Over 30 Classic Games with Advice from an International Array of Experts by Tom Whipple (Dey Street Books, 2015). “A Knowledge-based Approach of Connect-Four: The Game is Solved: White Wins” by Victor Allis (Vrije Universiteit, 1988). “Social cycling and conditional responses in the Rock-Paper-Scissors game” by Zhijian Wang, Bin Xu, Hai-Jun Zhou (2014). Watch Kurt Steiner set the stone skipping world record. Read this Quora forum for an explanation of how to win Connect Four.